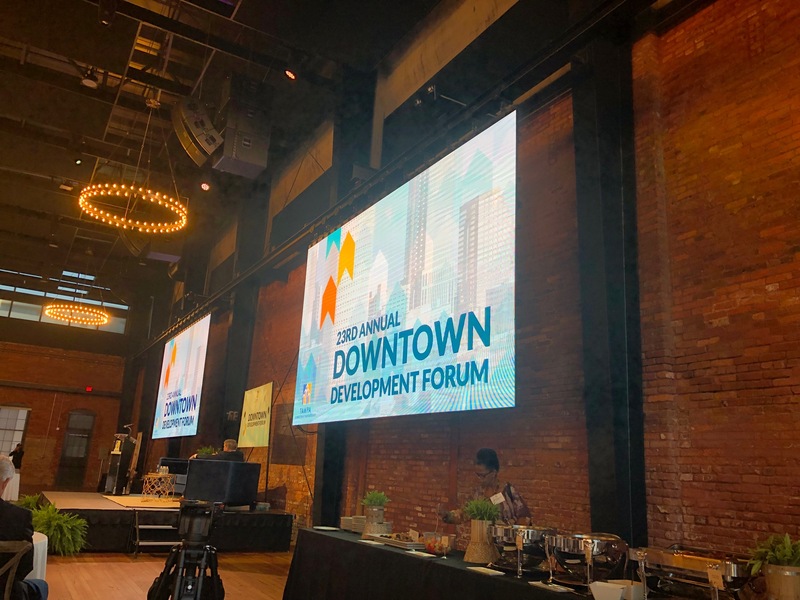 TAMPA Fla. (April 12, 2019) – Today, HCP Associates’ Vice President Robert Allen, Jr. presented the results of the sixth Biennial Downtown Tampa Worker and Resident Study at the 23rd Annual Downtown Development Forum hosted at Armature Works. This half-day event focused on the exploration of innovative ideas in urban development serves as a catalyst for discussion and problem solving regarding major urban issues. Each year, hundreds of downtown stakeholders, urban planners, developers, real estate professionals, property owners, public officials, arts and entertainment professionals and non-profit organizations attend this informative event. 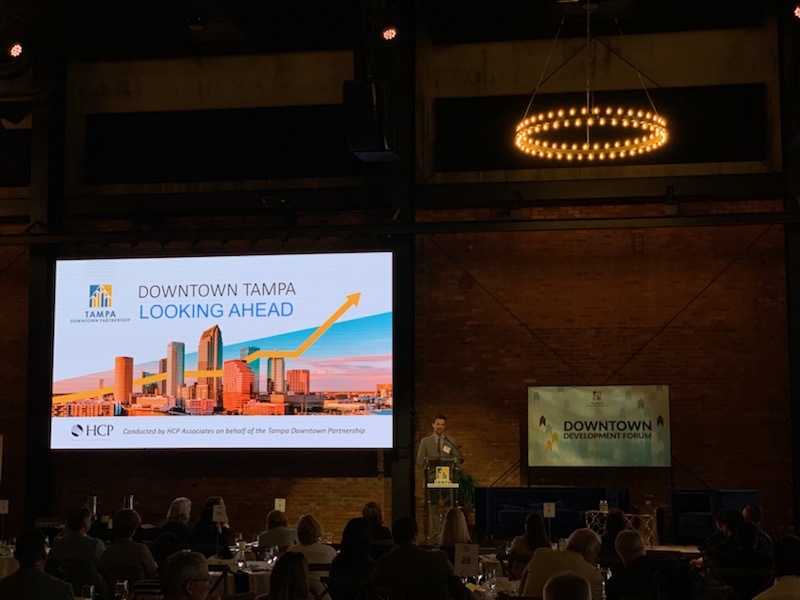 As an industry leader in the field of market research, HCP Associates has collaborated with the Tampa Downtown Partnership (TDP) since 2008 to survey residents and workers in Tampa’s urban core. Results from prior years’ studies have given rise to enhanced accessibility to the river, waterfront dining, events in the parks, new museums and attractions, extended operating hours for transportation and merchants, full-service grocers and more. “Downtown has the sustainable dynamics to foster a vibrant and diverse neighborhood. Understanding this information will allow Tampa to continue its upward trajectory as a world-class destination,” said HCP Vice President Robert Allen, Jr.
From the 2018 study, several trends have continued from prior years. Resident demographics continue to reflect a growing diversity in Downtown, with increases in the youngest and oldest age brackets continuing in 2018. In terms of hours, residents remain most active within Downtown Tampa from 6 p.m. to 9 p.m. Residents are 50% more likely to have lived in Downtown Tampa for five or more years compared to 2010. This reflects a downtown population that is setting roots in Tampa and calling the city home. Regarding workers in Downtown Tampa, four in five leave the workplace to experience Tampa once a week or more. Over the last eight years, positive signs have emerged that suggest that Downtown Tampa caters more to their after-work needs. There is a steady, increasing trend towards increased activity in the evening hours over the last four years surveyed, which suggests that more workers are opting to visit restaurants, bars, venues and other community spaces in the downtown area as opposed to returning directly home after work. 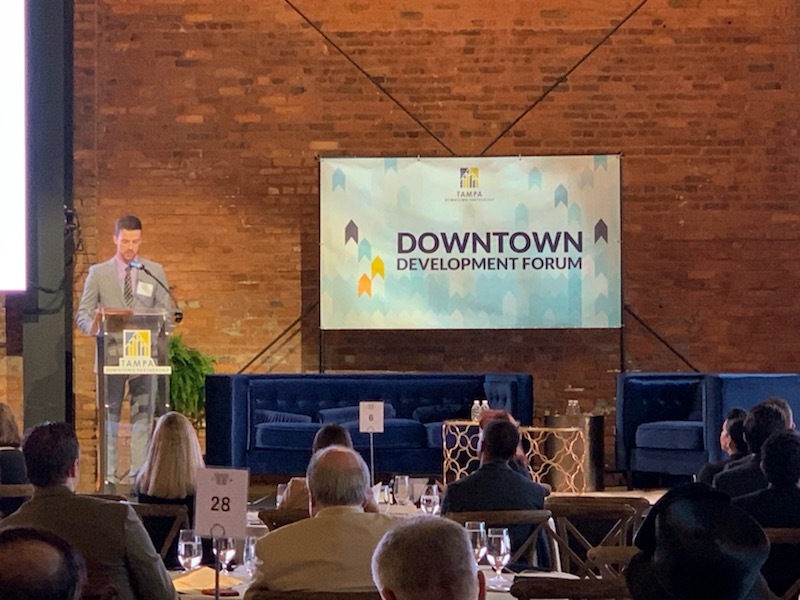 As new development shapes future opportunities in Downtown, the TDP is extending the opportunity to its valued stakeholders to offer insight into the future Downtown that they wish to see. The Special Services District expanded officially on October 1, 2018 to now include Tampa Heights within its boundaries. Residents and workers identified the Riverwalk as one of Tampa’s strongest assets. Testimonials referred the Riverwalk as the ‘spine’ of the city, connecting the area to activities and experiences for all to enjoy. The greatest opportunities for Downtown Tampa to improve according to the feedback of residents and workers remained focused on the areas of parking and traffic. Other topics explored at the forum included: advocacy, workforce and attainable housing, a comprehensive parking plan and the development of viable retail in the downtown area. David Downey, CEO and President of the International Downtown Association (IDA), served as the keynote speaker for the event. At IDA, Downey provides overall strategic direction and drives success towards the organization’s overall vision to build a world full of vital and livable urban centers. Opening remarks were made by City of Tampa’s Mayor Bob Buckhorn. Other statements were made by Kathy Castor of the U.S. House of Representatives, Jackie Toledo of the U.S. House of Representatives and special guest Ashon Nesbitt of the Florida Housing Coalition. As Tampa’s Downtown continues to undergo change, new patterns and trends will certainly emerge. HCP remains a pioneer in conducting meaningful projects that both serve and strategically engage the community. View the full presentation given by HCP Associates or read the full article about the survey.